Drawing breath: The map created by William Patten pupils and artist Al Murphy. 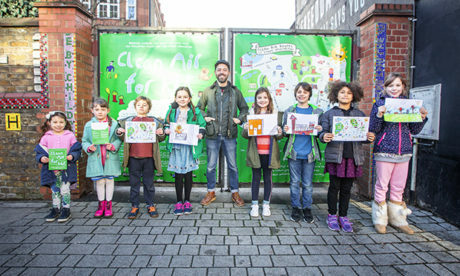 Primary school pupils in Stoke Newington have teamed up with a popular children’s illustrator to create a map of low-pollution walking routes in the area. 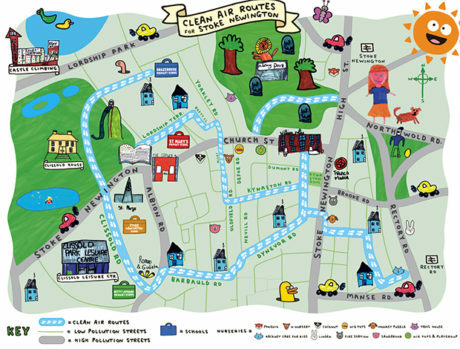 The map, which highlights toxic air hotspots and suggests alternative, cleaner routes to nearby venues, was put together by Year 4 children at William Patten Primary School with the help of artist Al Murphy. It is being distributed at local schools and nurseries to thousands of children and parents. William Patten, situated on Church Street, is at the centre of a row over the council’s plan to close off nearby roads to traffic, which campaigners say will lead to schoolchildren breathing in even more dirty air. To create their map, the pupils used personal exposure monitors to measure the amount of black carbon on various routes to schools and nurseries, as well as popular places such as the library, leisure centre and parks. Working with air quality experts and King’s College London’s Annual Air Pollution Map, they then charted the less polluted routes. Pupils with Al Murphy in front of William Patten’s school gates – now covered by the map. Lucy Harbor, an air quality expert who spearheaded the project, said: “Choosing backstreets instead of main roads can reduce your pollution exposure from that journey by as much as 50 per cent, and it won’t take you much longer. “Al Murphy is a brilliant illustrator – best known for his book Kitchen Disco. Most of the children know his work well and they were thrilled to be working with him. Murphy, best known for his book Kitchen Disco and who describes himself on his website as having a “worldwide reputation of being one of the most mediocre artists alive today”, said: “I wish I could’ve squeezed all the kids’ illustrations onto the map because they were all amazing. Large scale copies of the map and extra tips for reducing pollution exposure have been put on the gates of William Patten, and it is hoped they will also act as a barrier against pollution from the road and a nearby bus stop. Tom Knowles, a scientist and parent who also helped run the project, added: “Children are shorter so they’re closer to exhaust tailpipes and breathe in even more pollution than adults. A recent study by Unicef and Queen Mary University found children in London are exposed to 60 per cent of their daily air pollution during the school run and while at school – even though they spend more time at home. A Greater London Authority report last year found that pollution levels at William Patten are over the legal limit, but Hackney Council disputes its methodology.